FOR MORE DETAILED INFORMATION ON THE PLANTING AND CARE OF YOUR CITRUS SEE THE INFORMATION BELOW. They are orchard-proven fruit-producing varieties, grafted on cultivar specific dwarfing rootstocks. Grown in the ground, they create a highly productive tree averaging eight feet tall depending on variety. They will be much smaller grown in a container. Use a light, well-drained Potting mix, (we recommend Miracle-Gro Pam & Citrus mix). Be sure there are numerous drainage holes in the pot. Upper roots may be exposed. Water thoroughly, then fertilize after a week or two. Water weekly or more often if necessary in the summer months. For citrus to thrive, they need a good quality citrus fertilizer. Citrus Food is available where you purchase your citrus trees (if not have them order some from Hooked On Palms). Follow the manufacturer’s recommendation. Water soluble fertilizer can be used on foliage and soil. Granular or slow release fertilizer is sprinkled on the soil and watered in. The best type is citrus tablets or spikes. (We recommend Lutz brand). Yellow or dropping leaves are usually an indication of lack of fertilizer or overly wet roots. A sunny, wind-free, southern exposure is best. Allow room for the tree’s ultimate size. It is best to avoid lawns which receive frequent shallow watering. Microclimates are created by reflected heat from houses or walkways, providing heat for frost protection or summer growth if needed in your area. Good drainage is key. Plant root ball high so that when finished it will be slightly above garden grade. Use a light, well-drained Potting mix, (we recommend Miracle-Gro Pam & Citrus mix). First (upper) roots may be visible. Stake may be needed. Provide a generous watering basin. Do not allow soil or mulch to cover the trunk. Fill the basin slowly and let it soak in. 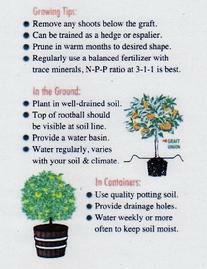 Water (thoroughly) weekly, more or less depending on your soil and climate conditions. Know where the GRAFT is on your tree. Remove all growth below the graft. Suckers take vitality from your tree. Trees may be pruned to any desired shape. They will look fuller with occasional pruning to shape leggy branches. Pinching back tips of new growth will help trees to round out. Some trees may develop erratic juvenile growth above the graft. If so, cut it back. Pruning can be done any time of year except the winter. Choose a container large enough to support your plant for several years. The larger the pot, the longer it can grow without repotting. A #5 pot is the minimum to consider for planting a one gal. size plant. It should be adequate for 3-4 years. A 7 or 10 gal.pot will allow more years of growth. A #15 pot or whiskey barrel will likely allow 8-10 years of growth. Consider placing a wheeled dolly under the pot to make it easy to move it indoors and out. Once you have the container, choose a coarse, well-drained potting soil. Propagation mix holds too much water and is not suitable. Check the label on the bag to see if any fertilizer has been added. If not, it is a good idea to incorporate some slow release fertilizer, either chemical or organic. Citrus plants like acidic soil so choose a fertilizer that works for Blueberries, Azaleas or other acid loving plants (We recommend the Lutz brand Citrus tablets). Partially fill your new container with potting soil, making a mound in the center high enough so the original soil surface of the plant will be a couple of inches below the rim of the pot. Remove your plant from its existing pot and inspect the roots. Usually it will be necessary to loosen them a bit to stop them from circling and get them growing away from the root ball. Loosen and pull our some roots from the edge of the existing root ball and drape them evenly over the mound of soil in the new pot. If roots are not long enough to drape them down the sides of the mound, simple rest the original root ball on top of the mound and fill the remainder of the pot, work soil around the roots and water well. Citrus like an outdoor environment during the growing season. You can leave your plant outdoors in late spring, summer and early fall, when there is no danger of frost. This will keep your plant healthier and reduce the potential of pest damage. Choose a site with at least! day sun. This can be a deck, patio, or any similar place. It should be close enough to your house or greenhouse so it is easy to move indoors in the fall. In the fall, move your plant indoors to a location with significant light. Do not put it in front of a heater vent or close to other such heat source. The transition from indoor to outdoor growing conditions and vice versa should be done over a period of several days. An abrupt change of environment can cause leaf and fruit drop. between a fully watered plant and a dry one. Be careful when watering dry plants as water may run off the side of the soil mass, giving the appearance of adequate water but actually leaving the root ball quite dry. Use of a moister meter is recommended. Use a good quality citrus fertilizer. (We recommend Lutz brand). Micro-nutrients are important, including iron, zinc and manganese. Leaf yellowing between the veins is a sign of micronutrient deficiency. Be sure to follow label instructions with any fertilizer you use. Most Citrus varieties are self-fertile so only one plant is needed for fruit production. Since Citrus typically bloom in the winter, you may want to play bee and help move pollen from flower to flower. You can do this with a small brush, with the appropriate buzzing sounds. Citrus fruit usually ripens the winter after flowering.